Home Alone House For Sale. Ahhhhh!!! If you’ve got $2.4 million, the iconic house from the classic movie Home Alone could be yours! 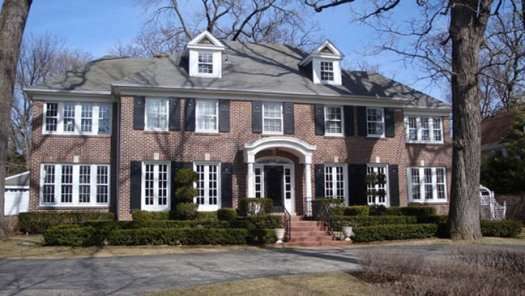 Made famous by the 1990 John Hughes’ movie, Home Alone, starring a very young and incredibly adorable Macaulay Culkin, the 4,250 square foot Georgian home sits on a half-acre of land located in Winnetka, IL, a suburb of Chicago. The home boasts 14 rooms, 3+ bathrooms, a screened-in porch, and of course the famous staircase Culkin slid down in the movie. The home is currently owned by John and Cynthia Abendshien, married empty-nesters who bought the property in 1988 for $875,000. Side Note: To prevent gawkers and fans of John Hughes’ 1990 film, there will be no open houses and all buyers will be pre-screened. In related iconic movie real estate news, the house featured in Ferris Bueller’s Day Off has been taken off the market. The Highland Park house was originally listed at $2.3 million, but had most recently been offered for $1.65 million, says Coldwell Banker agent Meladee Hughes. previous post: More Celebrity Babies Born, More Crazy Names Given. next post: Sir Paul McCartney Is Getting Married. Again. 50 queries in 0.905 seconds.